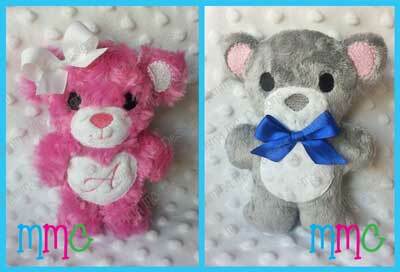 Make your own sweet Teddy Bear IN THE HOOP! Just one hooping, and VERY easy! 4x4 - 4 x 3"
5x7 - 5 x 7"
6x10 - 6 x 8.5"
8x12 - 7.5 x 10.5"
You will receive files for Teddy Bears with both Round AND Heart tummies. I've made almost 2 dozen and donated to our local Highway Patrol office for children when in need of consoling when involved in sad situations. I make of fleece and write messages on the tummy (I Luv You, Teddy,etc) They are most appreciated. Thank you for thisadorable design. 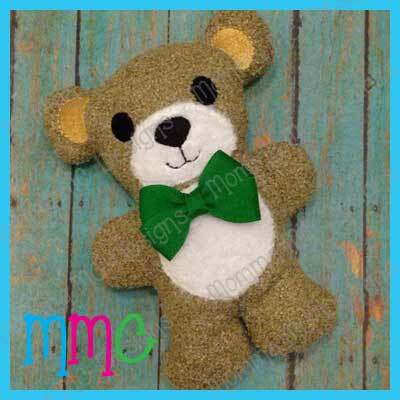 This bear is so cute and the stitchout is flawless. I have made three of them and they all turned out perfect. I did two white ones with different trim and a brown one. Won't be the last!